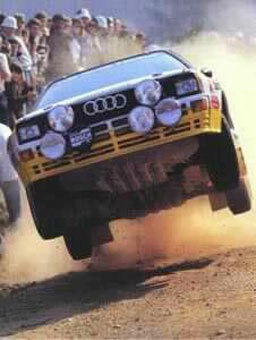 For 1983, the Quattro was homologated into the new Group B with wider arches and alternative gear ratios. This was known as the A1. This was quickly followed by an "Evolution" version permitted under Group B rules in May 1983 known as the A2. This had a smaller engine (2135 c.c.) to allow a lower minimum weight and 340 bhp. Results in 1983 gave Mikkola the World championship for drivers with wins in Sweden, Portugal, Argentina, Finland and second places in Kenya, Ivory Coast and Great Britain. Mouton had a quite year compared to 1982 with second place in Portugal, third in Argentina and a string of retirements. Blomqvist was 3rd on the Monte, 2nd in Sweden (in a non-turbo 80 saloon), 3rd in Greece, 2nd in Argentina and Finland and 1st on the RAC. Audi however, failed to win the manufacturers title as this was piped by the consistent Lance 037. 1984 saw Audi's peak continuing with the A2 whilst developing a new car. This was the most powerful rally car of it's time, the 500 bhp Audi Sport Quattro. This was a totally revised car with a shorter wheelbase and a 20v turbocharged engine to attempt to get better tarmac performance. It made it's debut on the Tour de Course but retired quickly. It took several months to get the car reliable enough to complete a rally. To strengthen the team, Walter Rohrl had been added to the line up for the year. He made his mark quickly with a win on the Monte Carlo with Blomqvist 2nd and Mikkola 3rd. Sweden was a 1-2 this time with Blomqvist 1st and Mouton following him home. In Portugal, Audi had to work hard for a result but Mikkola won with Lance 037's in 2nd and 3rd. Rohrl was 4th and Blomqvist retired. Mikkola finished 3rd on the Safari but both Mouton and Blomqvist retired. Corsica saw the debut of the Sport Quattro and it's arch rival the Peugeot 205 T16. Both retired but where as Rohrl was out with engine failure, Vatanen showed the incredible speed of the Peugeot before crashing. Blomqvist finished 5th in the older A2. Greece was kinder with Blomqvist winning and Mikkola 2nd in the A2's. Rohrl and Mouton both retired in the Sports. However, the 205's also broke down on this tough event. Blomqvist continued his winning streak in New Zealand with Mikkola 3rd. Rohrl retired with electrical problems in the older A2. The winning carried on in Argentina with Blomqvist 1st and Mikkola 2nd. Jorge Recalde was 3rd in a semi works Quattro A2. Finland saw the return of the Peugeot and Vatanen dominated the event. Blomqvist managed 4th in the A2 whilst Mouton and Mikkola retired in the Sport Quattros. A win in San Remo would have given Blomqvist the drivers title but it was not to be. Engine failure in the Sport Quattro on the 42nd stage saw him retire. 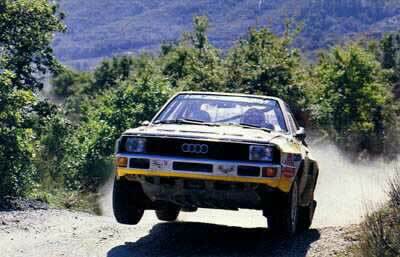 Vatanen won again in the 205 with the other Audi Sport of Rohrl also retiring after an accident. The Ivory Coast was ironic in that Blomqvist won this tough event to claim the drivers title using the Sport Quattro. It had chosen one of the toughest events on the calendar to become reliable. Mikkola was 2nd in the A2. The final round, the RAC saw an easy win for Vatanen with Mikkola 2nd in the A2 and Mouton 4th with the Sport. Blomqvist was not entered as he had already clinched the title. The massive effort by the team this year resulted in the Drivers title for Blomqvist and the Manufacturers title too. However, the writing was on the wall with Vatanen showing latterly what the T16 could do.